In general, a coin’s design will often see an update, or total replacement, after 30 or 50 years. But not Great Britain’s Gold Sovereign! First issued in 1817 as a replacement for the guinea, its design has barely changed – but in 2018, a special addition has found its way onto the coin’s reverse. 2018 marks the 65th year since Queen Elizabeth II’s coronation. This Sapphire Anniversary is being celebrated in many ways, including the addition of a special “65” mint mark on the reverse of this Gold Sovereign Piedfort Proof. Struck in approximately one half-ounce of 91.7% (22 karat) gold, this legal-tender “coin of the realm” comes struck with a double-thick Piedfort planchet, giving it twice as much heft as a regular Sovereign. It also comes struck in stunning Proof condition, with the now-legendary reverse of Saint George and the Dragon on one side and the latest official effigy of Her Majesty Queen Elizabeth II on the obverse – each minted with a frosted appearance while the field is made highly reflective by a special process involving multiple strikes using specially prepared blanks and dies. 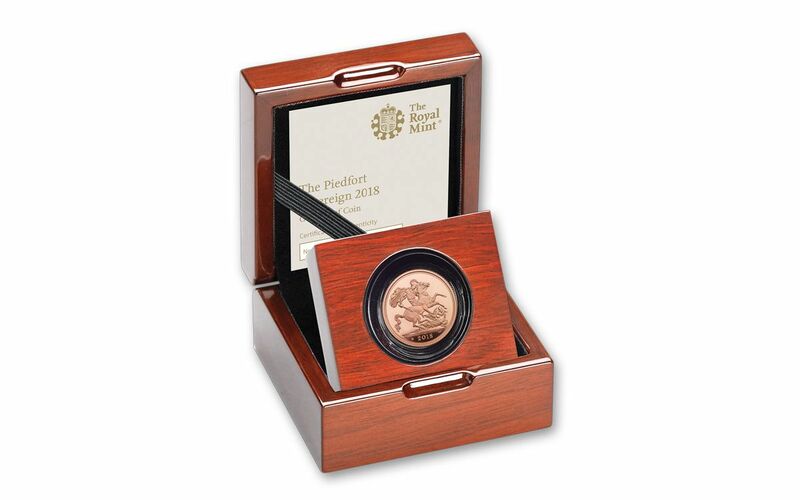 Double-thick proof coins are the epitome of the minter’s art, and with just 2,750 of these beautiful coins in existence, you can’t afford to pass this opportunity by. Join the celebration and secure yours today! CLASSIC GOLD SOVEREIGN DESIGN -- Saint George is depicted on the coin’s reverse slaying a dragon. The patron saint of England, Saint George’s conquest over the dragon is a metaphorical representation of good triumphing over evil. Designed by engraver Benedetto Pistrucci, this image has been used on the Sovereign since 1817. SPECIAL SAPPHIRE ANNIVERSARY MINT MARK – To pay tribute to the Queen Elizabeth II’s Sapphire Anniversary marking the 65th anniversary of her coronation, the British Royal Mint added a special crown-shaped mint mark with the numbers “65” engraved inside it. The mark appears to the left of the date on the coin’s reverse. 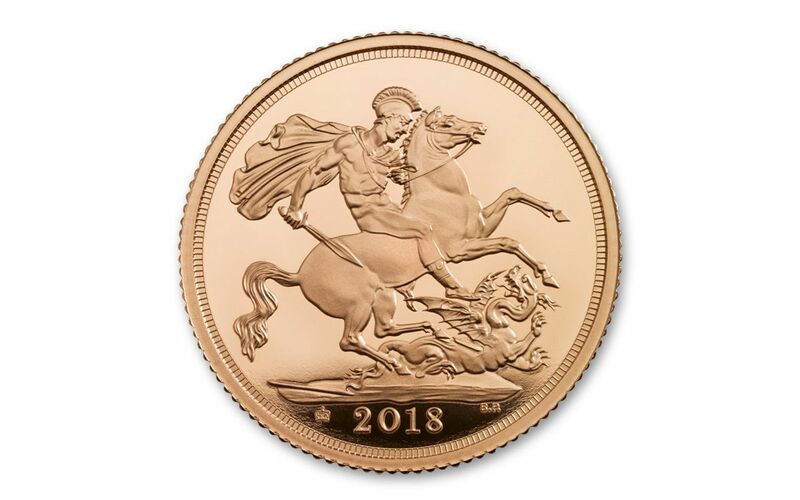 STRUCK IN 22-KARAT GOLD – The 2018 Great Britain Gold Sovereign double-thick Piedfort Proof is struck 15.976 grams of 91.7% (22 karat) gold. 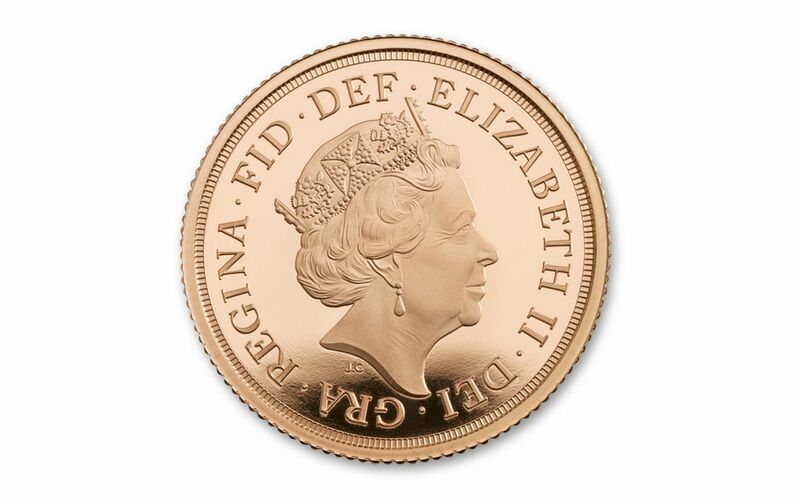 LEGAL-TENDER COIN – This gleaming gold bullion coin bears no denomination, but is worth 1 Sovereign. Gold Sovereigns are one of the world’s most recognized and respected gold coins. They are even carried by British super spy, James Bond. STRUCK IN GORGEOUS PROOF CONDITION – Your Gold Sovereign is struck in gorgeous Proof condition, meaning it was expertly crafted by the mint from hand-selected planchets, polished dies and multiple strikes to produce beautifully frosted details rising over mirror-like fields! LOW WORLDWIDE EDITION LIMIT – The British Royal mint has set the maximum worldwide edition limit for this coin at just 2,750. 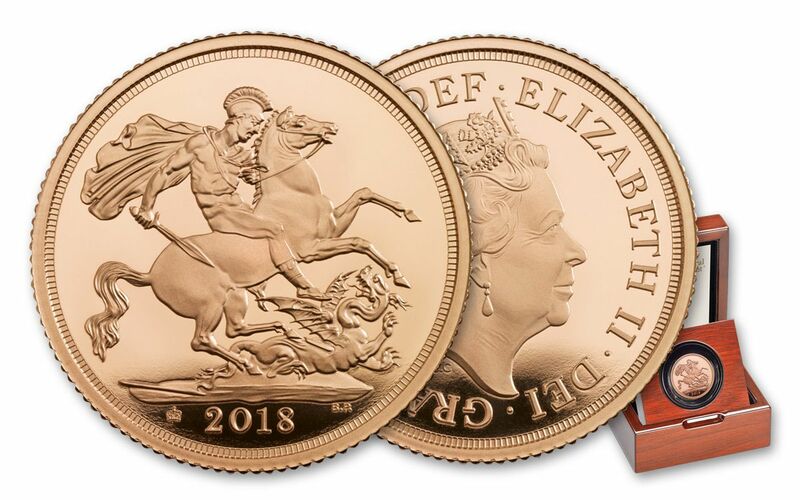 Celebrate 65 years of Queen Elizabeth II’s reign with the special 2018 Great Britain Gold Sovereign Piedfort Proof. Click one to your cart right now!